Taking The Golf Club To Your Fantasy Hockey Pool Part 1! Sometimes the hardest thing with playoff pools is realizing after two rounds that your team is basically just about done. So what we decided to do is have a little fun with the leading scorer’s list. Can you see our method to our madness here? Now may be the time to think about that beer. The cutoff we used here was eight points. That seemed to be a nice round number, figuring out leading scorer had 17 points before being eliminated. The 23 players that have eight points sounds pretty mighty but then there is the reality of how many have been eliminated. With the Capitals win on Wednesday, that pushes back a few more eliminations but one gets the idea. Playoff pools have some participants that are hurting in too many ways to count. What if we just placed out a table with the players remaining in the playoffs? This is what it would look like as seen above. That takes the list down to just 13 players. Suddenly this seems not so mighty. Suddenly it looks like a thinned out list like the golf power rankings from this week. After Saturday Night, a few more players will come off that list and then the cutoff may have to be lowered back to seven points. There are still points to be had from these few offensive players. It is expected that points will be harder to come by in the Phoenix-Los Angeles series. That may very well be true but one never knows. No one expected Phoenix to score nine goals in the first two games of the Nashville series. Then again maybe the Eastern Conference series is a low scoring snooze fest, who knows. That is the beauty of hockey and if you have even a few of these players left, all is not lost. Now if you have one or two of the goalies left, that is never a bad thing either. Most pools still value goalies but the main thrust here is scoring. That is going to be harder to come by especially when the most potent team left in the playoffs is likely the New Jersey Devils. Somehow I do not think that was expected when the second season began. New Jersey has proven it can score against the Rangers or Capitals so it will be interesting to see what they do in Round 3, especially with a six day layoff between games. Furthermore, will they open at home or on the road? That does not seem to matter much but for fantasy poolies, it does at least a bit this round. When you play two games at Madison Square Garden compared to the Verizon Center, there is a difference. 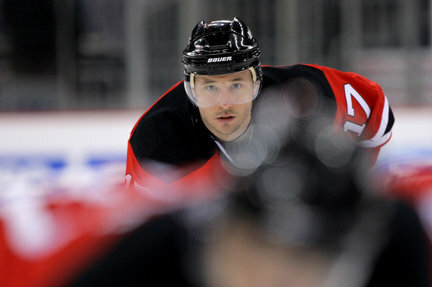 It all comes back full circle as Ilya Kovalchuk and company lead the remaining teams left in playoff scoring. Will it be enough to come close to the offense found in the first round in particular? That answer is no which is why goaltending is the real key but that is for another time. Stay tuned next week for the goaltending edition as we take a look at who is left and who has reached the golf course.